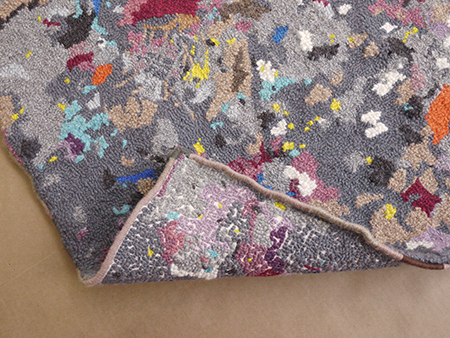 Jenny Heishman, "rug1 (confetti)," 2017, hand-hooked rug, wool yarn and cotton backing, 29 x 37"
Jenny Heishman is among the most unusual sculptors working in Seattle. She has completed a raft of public art projects which threaten to diminish her studio practice to the extent that, being preoccupied with art in public places, she had not had a solo gallery exhibition since 2015. This new work is a result of her residency at Banff Centre for the Arts and Creativity in Canada. She is toying with the interchangeability of media, to wit, investigating how pulped papers become hand-hooked rugs that look exactly the same. Three works are on view. Two “rugs” hug the floor. One is grey and beige, mimicking the recycled pulped-paper in her Banff works, with one corner curling upward. Another, in the center of the gallery, has a pale pink background with bright pink spots and what appear to be bloodstains in one corner. On the wall is a large 19-square “painting” in which graduated stacks of handmade paper pile up irregularly, alluding to a building wall. Rectangles are Heishman’s central shape in this grouping; they reference traditional painting shapes without becoming paintings. Suggesting subtle hints of paper’s origins, certain squares recall the purple of Chinese mulberry paper, the grays of torn cardboard, and the yellows, pinks and browns of commercial packaging. I miss the transparent delicacy of Heishman’s earlier works using glass, string, duct tape and other informal, flimsy materials to great purpose, but realize the current work is equally unprepossessing and underplayed. Heishman is returning to this quality after the hyper-materiality of her corporate commission for the late Paul Allen’s “Vulcan Real Estate, Woodpile” (2012), named one of the top 50 public art projects by the Public Art Network.